Whenever you create a letter, i.e. Aetna, a folder (Aetna) will be auto-created within your CodeToolz folder and that letter will be auto-saved in your newly created Aetna folder. This is true for all payers and letters. If the folder already exists, the letter(s) will be auto-saved to that existing folder without duplicating that folder. 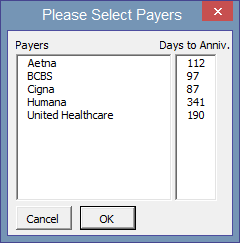 This one (as they all are) is key, this is why your payer fee schedules become outdated. Based on a sound Payer Negotiation Timeline you should be sending out Contract Renegotiation Notices 120-90 days out from the the Anniversary Date of any contract(s). You are going to be notified (just as to the right) of any contracts that have hit the 120-day mark. Select Yes, view and adjust letter(s) where needed, sign and send. Once you have created the Contract Renegotiation Notice, it will be noted in your Payer Contract Inventory and you will be notified again 120 days out from the next Anniversary Date. At a minimum you should be renegotiating an annual 2% – 4% increase. Your fee schedules must keep pace with increases in expenses. Note: For this letter and all others, they will be auto-placed on your letterhead and auto-saved in their respective folders. For the letter(s) you choose to create, you will be given a selection box. You are also going to be reminded again of the Days to Anniversary for your contracts – this is a key-date. You will be notified that the letters have been created, edit where needed, sign and send. Once your letters have been created, they will be auto-saved to the correct folder. If you make any changes to the letter, select Save and your changes will be saved, if you select Don’t Save, the letter will be saved as is.